The Spacelabs C50 patient monitor is the ideal solution for quality clinical care while supporting your budget. 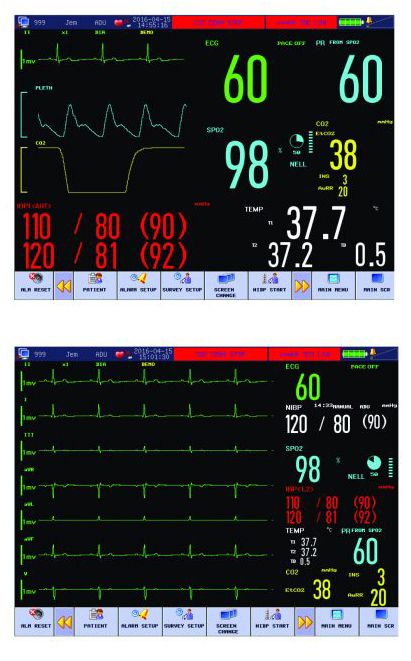 Measurements include ECG, SpO2, impedance respiration, non-invasive blood pressure, and temperature, with options for invasive pressure and ETCO2. The C50 provides flexibility for a variety of neonatal, pediatric, and adult environments. The C50 comes configured with the high acuity monitoring features that you need for the best care of your patients. Full functionality in a compact package. More than a bedside monitor, C50 offers portability and accessibility from bedside throughout transport. The built-in handle and mounting options make it highly mobile and suitable for most clinical environments. Caregivers can quickly access a number of vital signs presentations based on individual patient needs. With a 10.4” touchscreen and rotary knob operation, user interaction is simple and convenient. The C50 is engineered to meet the needs of caregivers and their patients. 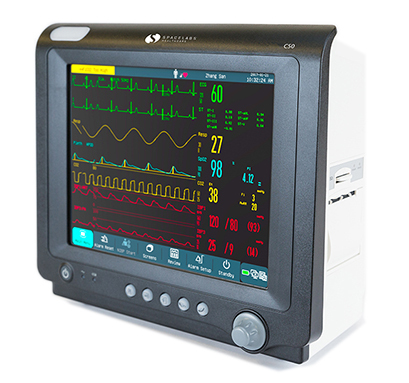 The intuitive design provides a high level of performance and reliability, supporting quality patient care. User interface includes a 10.4 inch touchscreen, 5 buttons, and a rotary knob. Power supply has an internal battery (2 hours of operation) and external AC. Connections include USB, RS-232, VGA, LAN, and a multifunctional port.